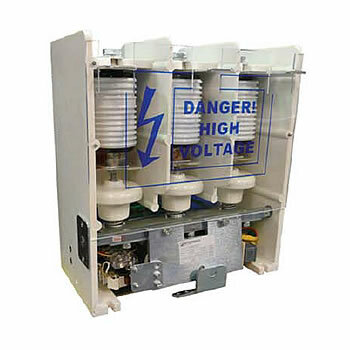 Motortronics MVF Series 7.2kV Class - 400A, ‘Non-Latching’ and ‘Latching’ Series of medium voltage three-phase vacuum contactors can be used in power systems with a rated voltage up to 7.2 kV and can be used for continuous AC operating currents of up to 400 amperes. Control voltage for the contactor is AC/DC 100~125V or AC/DC 200~230V*, including an auxiliary relay with 3 NO and 2NC contacts. 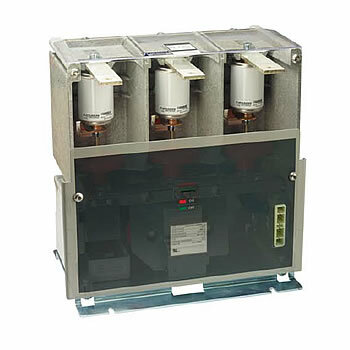 Motortronics MVF Series 7.2kV Class 630A and 800A, ‘Non-Latching’ Series of medium voltage three-phase vacuum contactors can be used in power systems with a rated voltage up to 7.2 kV and can be used for continuous AC operating currents of up to 800 amperes. Control voltage for the contactor is 110~120VAC or 220~230VAC*. The MVF Series 7.2kV Class 630A and 800A Class contactors are non-latching and use constant-on electromagnetic coils to close, and hold closed the vacuum bottle contacts. When the power to the electromagnetic coil is removed, the vacuum chamber contacts spring open (termed as; electrically held contacts or non-latching contacts). 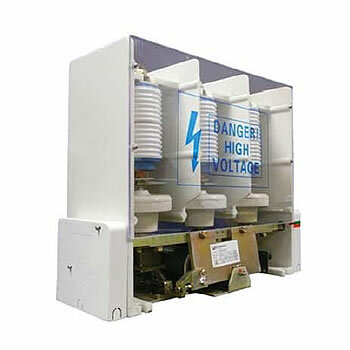 Motortronics MVF Series 12kV Class 400, 630A and 800A, ‘Non-Latching’ Series of medium voltage three-phase vacuum contactors can be used in power systems with a rated voltage up to 7.2 kV and can be used for continuous AC operating currents of uptot 800 amperes. Control voltage for the contactor is 110~120VAC or 220~230VAC*. The MVF MVF Series 12kV Class 400A, 630A and 800A Class contactors are non-latching and use constant-on electromagnetic coils to close, and hold closed the vacuum bottle contacts. When the power to the electromagnetic coil is removed, the vacuum chamber contacts spring open (termed as; electrically held contacts or non-latching contacts).